Sorry about the hairball. Look on the bright side. I'm not impacted. You know that sound—Kitty's hacking up a hairball. While it's a nuisance to clean up and even worse to accidentally step on, hairballs are better out than in the cat. You'd probably rather step on one with your bare feet than have it impacting Kitty's intestines. Cats are such fastidious animals. It's part of their charm. Kitty always wants to be clean and look his best. That constant grooming process means the ingestion of a lot of hair. While most hair goes in one end of the cat and out the other, some hair or fur clumps together in the stomach or intestine. That product is what Kitty hacks up on your carpet or sofa (it's always the carpet or sofa, isn't it)? Sometimes these fur balls can't be thrown up, but become impacted in Kitty's intestines. 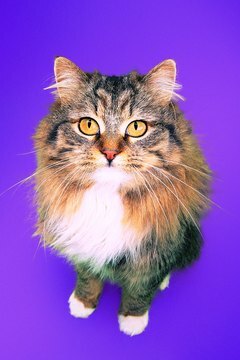 Long-haired, obese or older felines are even more prone to the hazards of hairball impaction. If your cat suffers a hairball impaction, one of the primary symptoms is constipation. He might be visiting the litter box a lot, hunched over and trying to eliminate. He can even howl in pain. If the litter box is suspiciously low on feces for a day or two, this may be the cause. He might also try to vomit with no result and stop eating. His abdomen might swell. Instead of constipation, he might experience diarrhea. 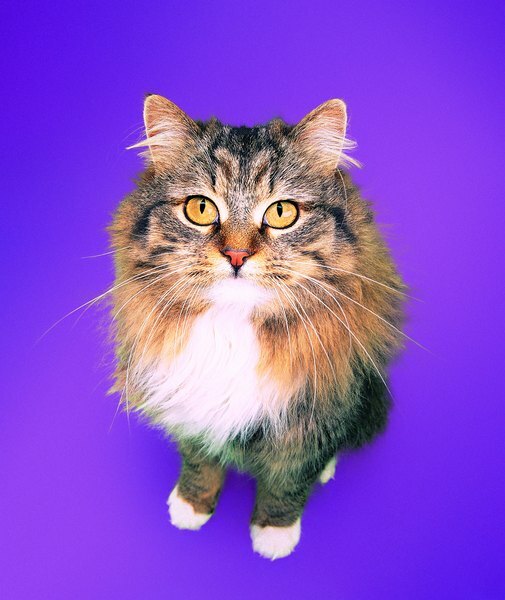 Your vet will likely give Kitty a laxative with a lubricating effect to expel the hairball. If that doesn't do the trick, or if the situation is already critical, surgical removal is necessary. Prevention is not only worth a pound of cure, it's worth a quarter-pound of hair clogging up kitty guts. Brush your cat regularly, even daily, to get rid of as much hair as possible. You can purchase hairball remedies in pet stores. These flavored, often petroleum-based products help keep things moving. Your cat may like the taste and you can offer it as a treat, or you can smear it on his paw and he'll lick it off. Feeding canned rather than dry food also helps lubricate the intestinal tract. Special hairball-control diets are available without prescription. What Does It Mean for Cats to Not Have Hard Stool? What Do You Do When a Cat Is Circling You & Rubbing Up Against You? Is it Healthier to Leave Food Out for Cats? What Does a Cat's Hairball Consist Of?